Saddam Hussein was a dictator who fought bloody wars with his neighbors. Saddam was the sole ruler of Iraq from 1979 to 2003. A year later, he began a bloody war with Iran. Iraq wanted to seize control of the oil-rich land in Iran. The two sides fought for nine years, and as many as one million people died, but neither nation gained in the war. The war with Iran left Iraq with great debts. Saddam needed funds to maintain his army, which he used to control Iraq. In 1990, he decided to invade Kuwait, a tiny nation about 1/25th the size of Iraq, but with almost as much oil. A multinational military force led by the United States responded to the invasion and liberated Kuwait in January 1991. Saddam allowed weapons inspectors into his nation as a condition of the cease-fire. The inspectors insured that he was not building weapons of mass destruction. In 1998, Saddam accused the inspectors of spying and ordered them out of the country. The United States and Great Britain responded with four days of bomb attacks in December 1998. Five years later, a multinational force led by the United States invaded Iraq and captured Saddam. The former dictator was executed December 31, 2006. 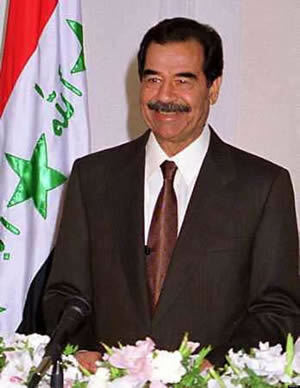 Saddam Hussein (1937 – 2006) was a brutal dictator who ruled Iraq from 1979 to 2003. 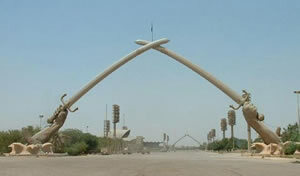 The Arc of Triumph was a monument constructed by Saddam Hussein after the Iran Iraq war. The Hands holding the swards were modeled by the Iraqi dictator. The helmets at the base were taken from the heads of dead Iranian soldiers.